We owe a debt to our Iraq and Afghanistan war vets. Why is Washington so slow to take responsibility? Soldiers from the 3rd Brigade, 1st Cavalry Division salute during a re-enlistment ceremony for Staff Sergeant Brant Smith while preparing to depart in the last American convoy to leave Iraq at Imam Ali Base, formerly Camp Adder, on Dec. 17, 2011 near Nasiriyah, Iraq. This is a month for painful anniversaries. 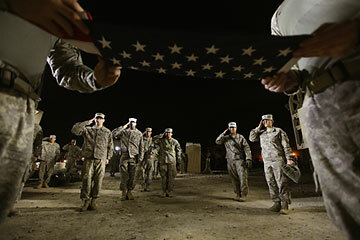 It is 10 years since the start of the benighted war in Iraq. It is also one year since March 11, 2012, the day Staff Sergeant Robert Bales allegedly massacred 16 civilians in the Panjwai district of Afghanistan. But I'm more concerned about a silent anniversary: the next day, March 12, 2012. It was an absolutely terrible day for Iraq and Afghanistan veterans, especially those looking for jobs. It was a day--yet another day--when the headlines were about a trooper gone berserk. This is true far too often: veterans involved in gun violence, suicide or domestic abuse, homeless veterans, addicted veterans. The woes are endless. The problems are real. But the vast majority of veterans don't suffer from them. And there were no high-profile public figures to stand up and speak for the majority in the days after the Bales massacre, especially for the thousands who were thanked for their service--and then quietly turned down for work because employers, well, they didn't want to take any chances. Eric Shinseki, the secretary of veterans Affairs, should be the leading advocate for these troops. He should have been everywhere in the days after the massacre, promoting those veterans--and they exist all over in this country--who are fabulous employees, fabulous first responders, brilliant entrepreneurs in both the public and private sectors. But here's a question: When was the last time you saw Shinseki say or do anything in public? He is universally regarded as an exemplary man. But even his supporters say he's old-school military, stoic, wary of the press. And his detractors, who are legion among the generation of Iraq and Afghanistan veterans, say he lacks the creativity and leadership skills to deal with Veterans Affairs' mind-boggling problems, like the 900,000 unprocessed disability cases. In any event, he has been in office for four years, and the problems our veterans face are worse than ever--and about to get still worse as the military demobilizes tens of thousands of additional troops in the next few years. It is time for him to step down. To be sure, the problems are not all Shinseki's fault. There's been a lot of flag-waving and patriotic blather from politicians, but there's also been a scandalous absence of action. The First Lady has been a valuable spokesperson for military families, but the President's record has been less than mediocre. Take, for instance, the absolutely ridiculous scandal involving the inability of the departments of Defense and Veterans Affairs to come up with a united system for electronic medical records that would allow troops to move seamlessly from the military to the VA. Barack Obama has been het up about electronic record keeping since the day he was elected. In 2009 he announced a plan to create a seamless system for the military. We have now spent $1 billion on developing such a system, and in February the two departments announced that they had failed to come up with one. This was not Shinseki's fault. The VA has an excellent record-keeping system called Vista. The Defense Department wasn't sold, however. It hasn't decided what sort of system it wants. If the President were on top of things--if he were as good as his word about taking care of the troops--he would step in and force the decision to be made. Yesterday.